Leading OEM Manufacturer of oil free gas and air compressors from Ahmedabad. We are among the distinguished names in the industry for manufacturing and supplying Oil-Free Gas and Air Compressors. 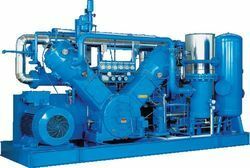 The offered compressor is operated by the means of diesel and is made in tune with the latest generation trends for offering optimum grade product to the customers. This compressor finds wide usage in a gamut of industries including pharmaceutical, food processing, engineering and automobile. Looking for Oil-Free Gas and Air Compressors ?